Join by 10/31 to get a free backpack and over $1,000 in member benefits. Serving as the voice of the scientific community. Helping scientists communicate with the public on climate change and other issues of global importance. Providing our members with robust career resources. Analyzing trends in federal research and development funding. Supporting STEM education at all levels to inspire future scientists. Your membership supports these initiatives and other programs that further international science diplomacy, diversity in the scientific community, and research competitiveness. and receive a free backpack before this offer expires on Oct. 31. Engage with top scientists and engineers across disciplines – locally, nationally, and globally – through member-only forums, discipline-specific sections, meetings, regional divisions, specialized online communities, and additional exclusive resources. Develop critical skills in leadership, management, and the responsible conduct of research with extensive resources and programs that include our new Career Development Center. Chart the future of your career with our new Career Development Center, myIDP, the extensive resources on Science Careers, specialized online communities, and other exclusive benefits. Access extensive classroom resources for science teachers and students, including online lesson plans and more with award-winning programs such as Science NetLinks, Project 2061, and Science in the Classroom. Stay connected and active in communicating the value of science and promoting advancements in science education through advocacy, community outreach, and volunteer opportunities. 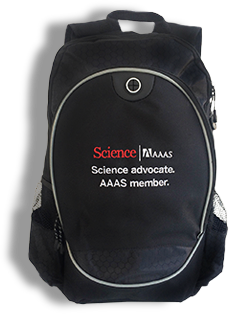 by 10/31 to receive a free Science/AAAS backpack. Backpack offer valid from October 1, 2016, through Oct. 31, 2016, while supplies last, for new and previous individual members only. There is a limit of one backpack per membership order. Please allow 2-4 weeks for delivery. The Science/AAAS backpack is provided as is without any guarantees or warranty. In association with the product, AAAS makes no warranties of any kind, either express or implied, including but not limited to warranties of merchantability or fitness for a particular purpose. Use of the product is at the user’s risk.